N97 Music Library | BDC Software Inc.
As I said in the previous part, the N97 sound playback is very good. There is no distortion, no hissing or cracking during playback. Even when you use the equalizer there is no audible distortion as long as you stay within sane limits. 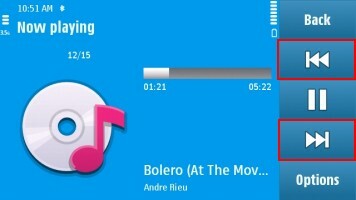 The multimedia player is organized as pretty much any other player out there: It scans the mp3 files and organizes them by the usual tags. In addition you also have the ability to play songs based on playlists. The drawback is that like any other player (except for rockbox) it does not allow you to play songs based on folder structure (which is my setup). Unfortunately not all my music folders have playlist files and the multimedia service on the phone will not create automatic playlists based on folder structure. One workaround that I created and use is a small python script that will scan the library and automatically add .m3u files to folders containing mp3 files. Right now the script has to be run manually but I am in the process of converting it to a background service. Even though the sound quality is phenomenal, there are some usability issues with the player that should be addressed by the dev team. The first annoyance is that the player forgets the “Last Played” item. This does not sound as a big deal, but is quite important if you have a large library. The auto-rotate feature switches between landscape and portrait mode frequently and you don’t know which mode it’s in when you pick-up the phone. The button placement in both modes is different and so you have to look at the phone to see what’s going on. This causes two issues: if you are not precise you will hit the back button (very annoying) and of course depending on the portrait/landscape mode you don’t know if you are navigating forward or backward. Also the buttons are too small and are too close the bottom edge of the phone. I know it was convenient to reuse the button API but the usability suffers big time here. 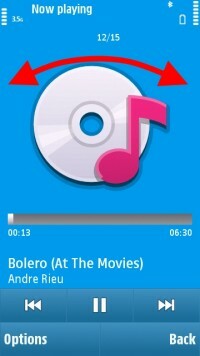 There are some additional “nice to have” items like: song rating, history of songs played including most played list that are missing from the player . In addition it would be nice if the main screen widget could span two slots so that it’s easier to navigate the songs without looking at the phone (again that usability thing). Even though the software player has some usability issue I still use it as my primary mp3 player. The convenience of having to carry only one device outweighs the issues and with small modifications this could become a great player.